IT reviewers are encouraged to use this software and any other related materials. We will be pleased to grant you a registered version for FREEWARE. 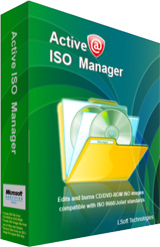 CD editors are authorized to include the trial version of Active@ ISO File Manager in their CD-ROMs. with the ISO 9660 / Joliet standards. Command line parameters are supported to automate the ISO authoring/burning process. you entered are stored as user's settings.